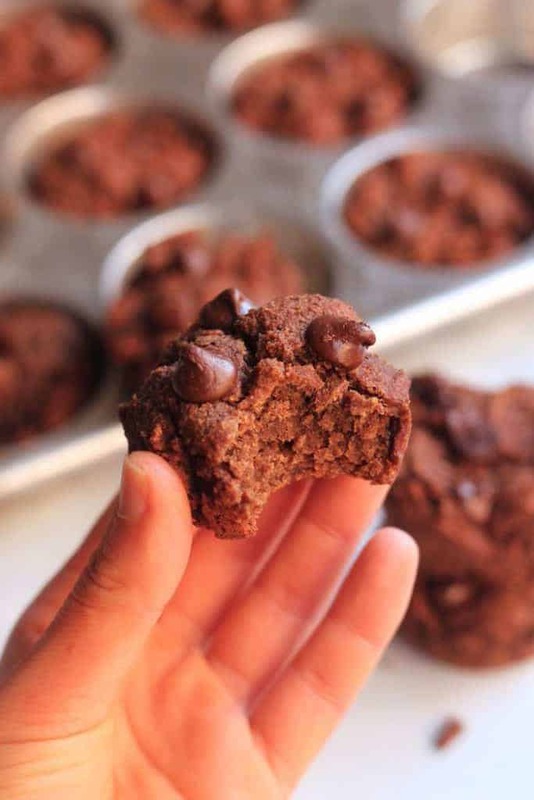 These One Bowl Vegan Chocolate Banana Muffins are super moist and secretly healthy! Made with whole grain oat flour, almond flour, and sweetened naturally with bananas and dates, they make the perfect healthy and delicious treat or snack. These here mufadoos are like your bestest frenemy. Like, I love them but I don’t necessarily like them. Why? Because one second I make them and the next second they’re gone. Into the depths of my tummy with seventeen glugs of almond milk. They make the apartment smell like Charlie and the Chocolate Factory and they’re so freaking tasty that you really can’t have just one. Or four. This recipe kind of happened on accident. I was minding my own biznass making my beloved Vegan Chocolate Banana Muffins when I thought, “an extra nanner never hurt anybody.” I proceeded to make the recipe per usual and then somehow forgot the oats. The result with more nanner, no oats, and a couple other modifications was an even better vegan chocolate banana muffin recipe than the original! What I really adore about this vegan muffin recipe is that although they’re sweetened naturally with ripe bananas and dates, they squash your sweet tooth cravings like woah. It’s like a wholesome snack meets dessert. It’s like, perfect. I went ahead and added chocolate chips to this version as well because duh, chocolate chips. For one batch I used a bit of oil (I love avocado oil from Costco for baking and high heat cooking) and for one I didn’t. To be honest, there wasn’t a huge difference. I’m not one to shy away from moistness so I went with the version with the oil. Bob’s Red Mill super fine almond flour (plus this oat flour), which is essentially super finely ground blanched almonds, provides another boatload of moisture thanks to all those delectable fats. Now let’s talk about what I mean when I say you want black bananas. I mean BLACK BA. NA. NAS. Literally. 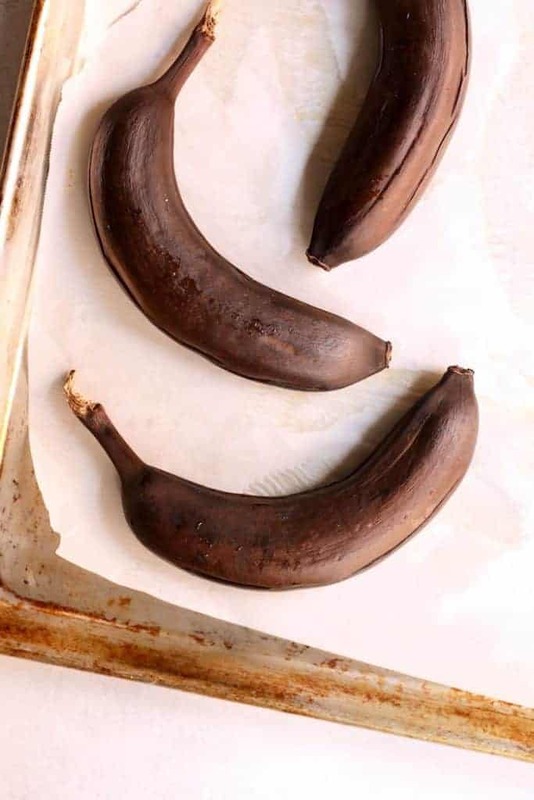 Here’s a little hack I learned if you have unripe bananas: Place the whole, unpeeled bananas in the oven and bake at 300F for 30 minutes. Voila! Bake-ready black bananas on demand. Beware that this batter is very, very thick—almost more like a dough! You’ll need to spoon it into the muffin tin and likely proceed to repeatedly lick said spoon until half the batter is in your mouth rather than the muffin tin. 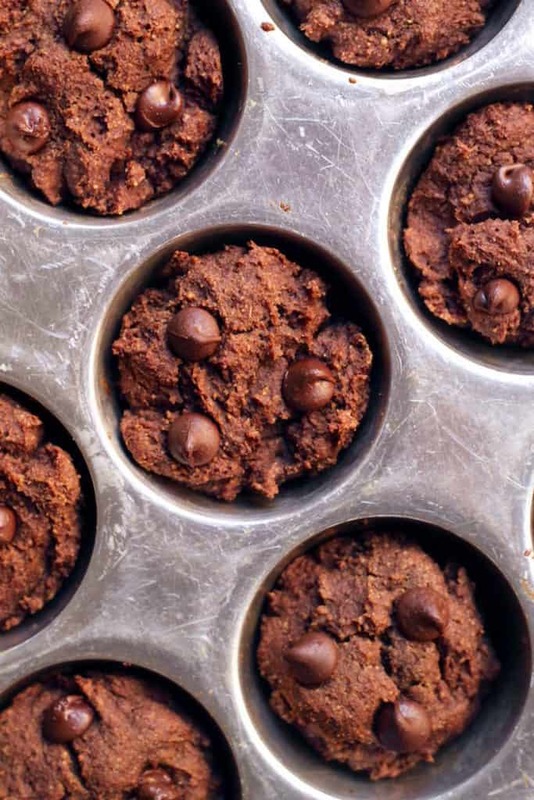 The other best part about these muffins is that all you have to clean is the food processor. Not that that’s my most favorite kitchen appliance to scrub…but hey, it beats three bowls. I mean I’d be lying if I said I didn’t occasionally dream about this being a muffin blog. 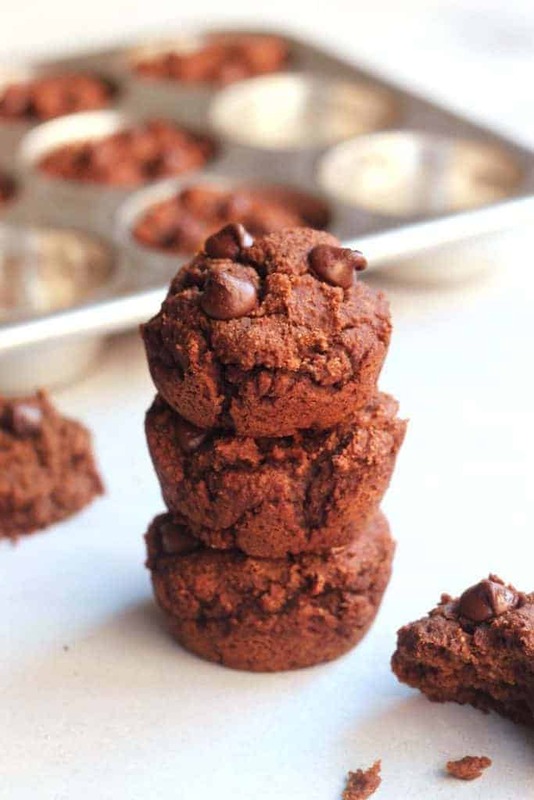 These ultra moist One Bowl Chocolate Banana Muffins Made with whole grain oat flour, almond flour, and sweetened naturally with bananas and dates, they make the perfect healthy and delicious treat or snack. Vegan and Gluten-free! Place dates, bananas, oil, almond milk, vanilla, and coffee in the bowl of a large food processor. Blend until completely smooth and creamy. Add oat flour, almond flour, cacao, flax, baking soda, and salt. Blend just until combined. The batter will be very thick. 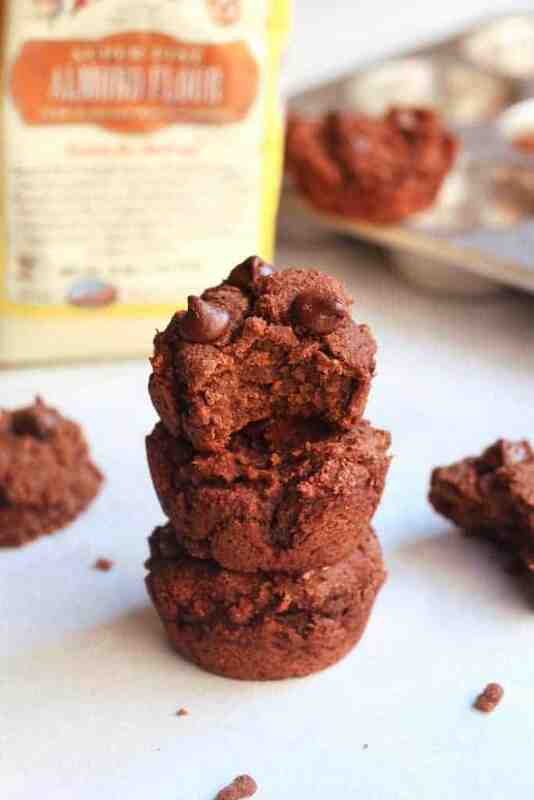 Fold in optional chocolate chip, setting aside a few for topping each muffin. Spoon batter into prepared muffin tin, filling about 3/4 way full. I like to wet my finger tips and lightly smooth the tops (but don’t press too much or muffins will be firm). Top each muffin with a few chocolate chips. Bake for about 25 minutes. Allow muffins to cool in tin for 15 minutes before transferring to a cooling rack to cool completely. *If dates are hard, soak in warm water until softened. This post is sponsored by Bob’s Red Mill. Thanks for supporting the brands that I adore! I’ve done that banana ripening hack before! Such a lifesaver when I’m craving banana bread/muffins/cookies ASAP and don’t have ripe bananas! That’s what I like to hear :) Let me know how you like them! These sound delicious, definitely need to give them a go! Can I sub more oat flour for the almond flour? Almond flour is much more moist so I’d worry these would be dry! I haven’t tried it so I can’t say :/ If you have almonds at home you can grind those up for flour! These look awesome, and I love how mistakes can often lead to even better things! :) I’ll have to try the oven banana trick; I’ve heard of it but never actually tried it. Plus, Bob’s Red Mill makes the best ingredients for baking Pinning this one now! Hey Vicki, I don’t count calories or post nutrition information but you can enter it into MyFitnessPal for nutrition info! Can we leave the coffee grounds out? Is there something we should add in replacement of? can you another sweetener besides dates? Like maple syrup? I can’t count the number of times I’ve made these. I can do it even early morning, barely awake! I’ve also made these for guests as desert served with ice cream. People pleaser for sure. Thanks for sharing it. We have almond allergies in the family. Can you suggest a sub for the almond flour? Thank you!